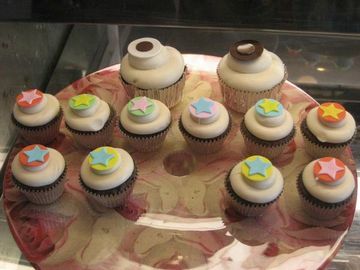 For my LA Cupcakes MeetUp group's sixth stop (we're now at 132 members! 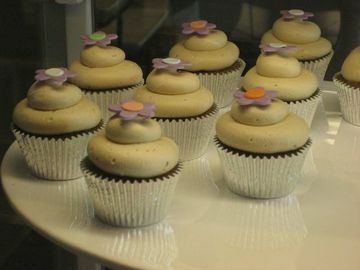 ), we headed out to Sherman Oaks to visit Leda's Bake Shop. There we found mini cupcakes ($1.50 each) similar to the ones at Vanilla in Santa Monica, however these were much better and came in more flavors and with cute hand-made sugar fondant decorations on top. Unlike the new comers that we tried recently, this shop has been open for over two and half years now and offers vegan cupcakes, which I thought I'd surely detest, but the Red Velvet vegan mini cupcake was surprisingly, sweet, moist and delicious. They do not use artificial red dye though, so although it tasted like red velvet, it didn't look it. I also sampled their yummy lime coconut, which had a layer of lime curd underneath the icing and bits of coconut inside the cake. I tried their passion fruit cupcake too, which tasted like a yummy drink. Another one that I ate was the chocolate raspberry, which although I normally like in a chocolate bar, I found it to be just OK in cupcake form. I think I'm biased though since I prefer vanilla cake generally. Lastly, I brought home the Dolce de Leche for Raphael who quickly devoured the treat with no complaints. Overall, everyone raved about the vegan red velvet, the chocolate chocolate chocolate, the espresso and of course the cute designs and mini sizes. One member commented, "The minis are the perfect size to assuage any feelings of guilt!" Oh and the bakery’s Blondie bars and chocolate chip cookies were yummy too, in fact several members purchased to go bags (more photos). J'ai un amour secret pour un blogger. Ne pas inquiéter ce blogger n'est pas vous. Mais avez-vous une suggestion ? Une plus de chose à dire. Les gâteaux heureux à toi et à tout votre ont aimé ceux. Au revoir et merci beaucoup !